Various groupings of Jovian moons with the newly discovered ones shown in bold. The 'oddball,' called Valetudo after the Roman god Jupiter's great-granddaughter, has a prograde orbit that crosses the retrograde orbits. | Roberto Molar-Candanosa, courtesy of Carnegie Institution for Science. Among the moons is Valetudo, which appears to have smashed into several of Jupiter’s large moons and broken them apart. A newly discovered moon around Jupiter — spotted traveling in a strange orbit — likely crashed into some of the gas giant's other satellites long ago, transforming a few worlds into many. The moon, named Valetudo after the great-granddaughter of the Roman god Jupiter, is among 12 new moons found around the planet. But the oddball moon may be the most interesting because it tells researchers more about what Jupiter's moons looked like long ago. Researchers have known that Jupiter had three groups of moons. There were the Galilean moons, first discovered by Italian scientist Galileo in the 16th-century, which formed from a cloud of gas and dust around Jupiter while the giant planet was young. Two other groups of moons are essentially objects captured by Jupiter's orbit when they flew too close to the huge planet. Prograde moons travel in the same direction as Jupiter's rotation, but are located beyond the closely orbiting Galileans. Retrograde moons travel opposite to Jupiter's spin and in the outer reaches of the Jovian system. Eleven of the 12 new moons fit into these prograde or retrograde groups, but not the oddball Valetudo. Valetudo is zipping along in an orbit that is opposite to its retrograde neighbors and that crosses their paths at an inclined angle. In other words, the moon is like a car speeding along a highway in the wrong direction, Scott Sheppard, an astronomer at the Carnegie Institution of Science, told Seeker. And like a car careening dangerously on a busy roadway, Valetudo caused celestial crashes in the past that broke a few retrograde moons into several. "What we think happened was there were three much larger retrograde moons, which were hundreds of kilometers in size. The parent moons were hit by something and they were broken apart," Sheppard said, adding that the something was likely Valetudo. Sheppard was principal investigator with the research team that made the discovery. The moon we see today is the remainder of a much bigger world that blew apart after the crashes. While Valetudo is smaller now, it remains a menace to its conformist neighbors. Sheppard said another collision will likely happen during the solar system's lifetime. Researchers would like to get a close-up look at the moons. The trouble is: Jupiter lies four times further from Earth than the sun. So a telescope isn’t able to capture much more than the moons’ orbits. For greater detail, a spacecraft is needed. Jupiter does have a NASA spacecraft orbiting it right now, called Juno. But Juno is too close to the huge planet and its field of view is too small to capture images of the planet, Sheppard said. Instead, scientists will have to wait for a future spacecraft, either flying past Jupiter or orbiting it. One possibility is NASA's Europa moon mission planned in the late 2020s or early 2030s. Sheppard's team found the moons while searching for Planet Nine, a distant, undiscovered planet thought to be altering the paths of objects in our solar system. "Jupiter was well-placed in the sky to kill two birds with one stone," Sheppard said. 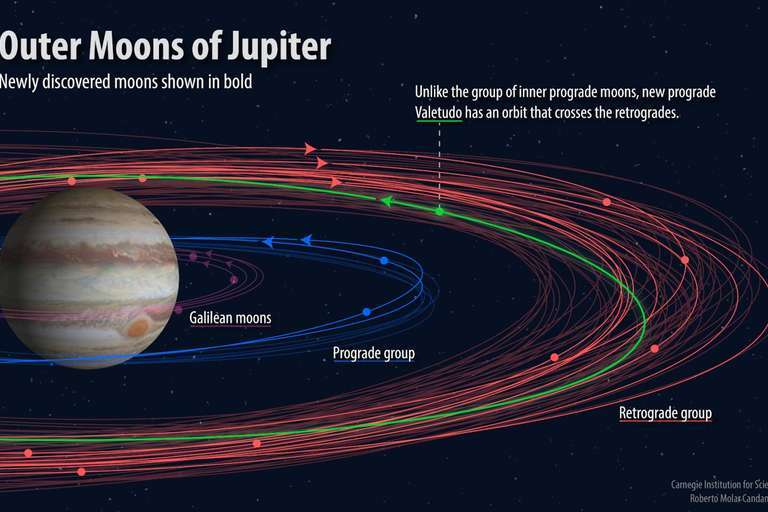 The researchers targeted objects moving with Jupiter in the foreground, which revealed the 12 new moons. At the same time, they watched for Planet Nine or smaller, distant dwarf planets in the background. Researchers found the new moons thanks to a telescope upgrade. 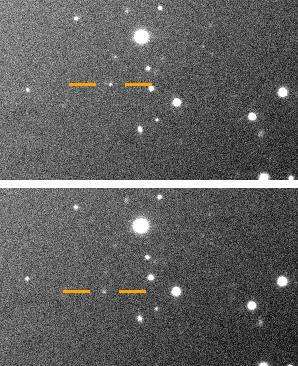 They used the Blanco 4-meter telescope at Cerro Tololo Inter-American Observatory in Chile, which just received a dark energy camera optimized to look for faint objects in the sky. Sheppard added that his team performed similar moon searches at Uranus and Neptune — but came up empty. The new find boosts Jupiter's moon count to 79, easily making it the most populous place for moons in our solar system. The runner-up is Saturn, which has 62.